It's time to come to Pittsburgh and find the others! 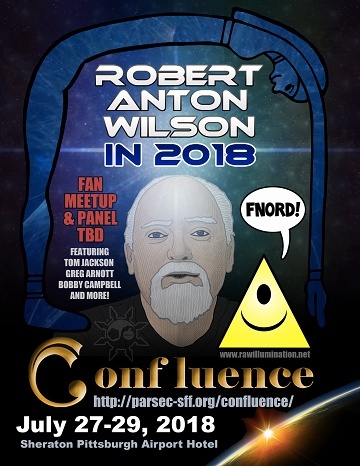 This weekend, in and near the Confluence SF convention. Here's an illustrated guide and update. Friday: I will interview Prop Anon at 4 p.m. I can't give you a location yet, as I apparently will have to do so in my hotel room, but connect with me via social media (@jacksontom on Twitter) and I'll try to let you know when I know. Or try email: tom.jackson (at) gmail.com. Or if you know Bobby or Greg, contact them. Saturday: 2-4 p.m. RAW coffee talk, with Bobby Campbell and me, details above. I will talk about Robert Shea. Bobby has two talks he can offer, one on his adventures illustrating "Historical Illuminatus" and one on the Kenneth Noid-Dominos Pizza incident. 9 p.m. -- Greg Arnott will talk about RAW and magic, in my hotel room. Exact location to be announced at the coffee event, or contact me via Twitter or email. 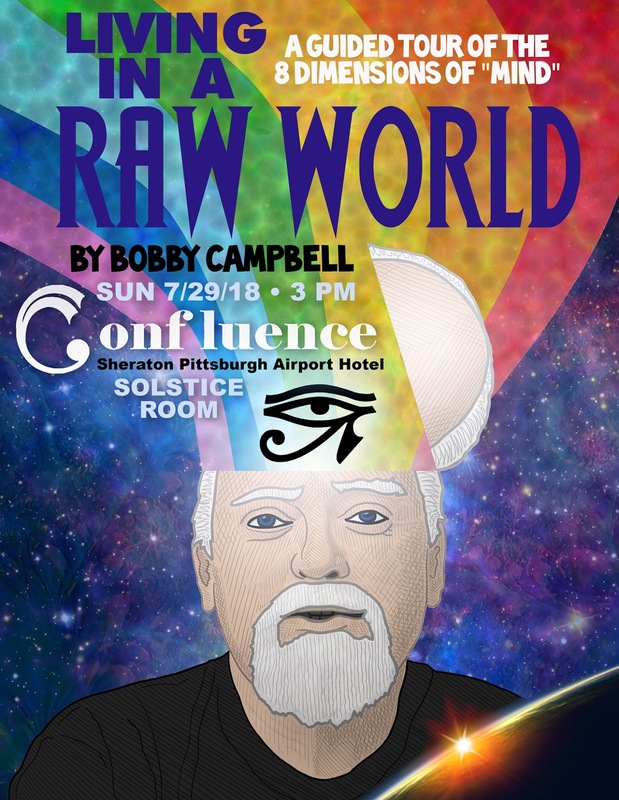 Sunday: 3 p.m., presentation by Bobby Campbell at the convention, "Living in a RAW World." 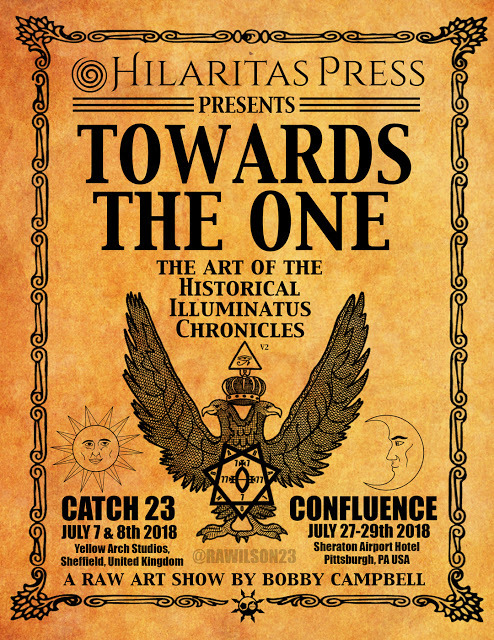 Art: The convention art show will feature Bobby Campbell's new illustrations for the three Historical Illuminatus Chronicles books just released by Hilaritas. Confluence is the only place to see Bobby's exhibition anywhere in North America in 2018. 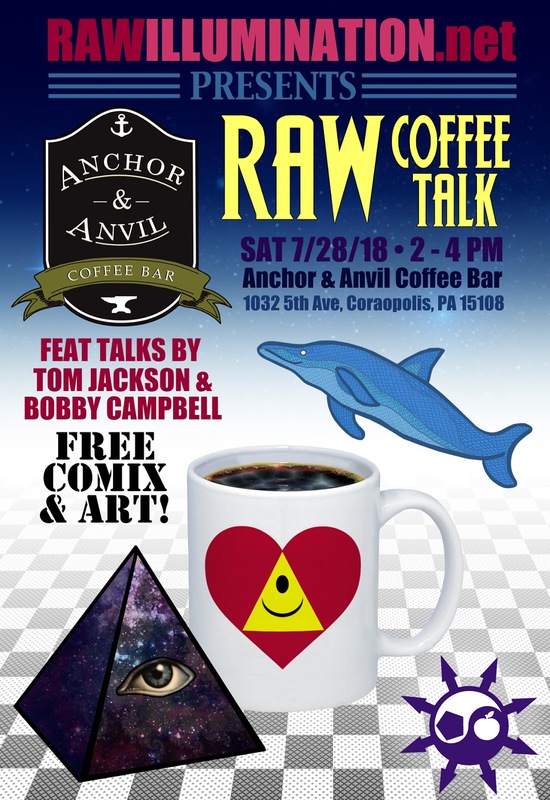 The rest of the time you can hang out with us or enjoy what promises to be an excellent convention, featuring the prominent writer Catherynne Valente, Geoffrey Landis, Mary Turzillo and others. Thanks to Bobby for the wonderful flyers.